Summer is here and the family schedule is about to be thrown out for a few months! The tradition of taking a break from the confines of a work/ education schedule is enjoyed around the world by all cultures. Don’t get us wrong, schedules have their time and place, just not summertime! There is one area that can become more difficult when you lose the schedule for the summer: Keeping up with your teen driver! During the school year, we know where our teens are because they have places to go and things to do. But during the summer…. Parents are working and teens are home. No schedule means no idea where you kids are! During the summer teen deaths related to auto accidents increase. In 2012, June and July had the highest numbers of teenage crash deaths of any months. The AAA Foundation for Traffic Safety released a report in May 2012 that showed that the risk of 16- or 17-year old drivers being killed in a crash increases with each additional teenage passenger in the vehicle. The risk increases 44 percent with one passenger; it doubles with two passengers, and quadruples with three or more passengers. Motor vehicle crashes are the leading cause of death among 15- to 20-year olds, according to the National Center for Health Statistics. Here are some recommendations that will help you keep track of your teen driver this summer and decrease the likelihood for an auto accident! You can now sync your family calendar with all devices and share it with your entire family. This is a great, free tool that will help keep everyone in the family on the same page. We recommend having a family calendar planning meeting weekly to discuss events for the week and make sure they all make it on the calendar. Any changes that are made will be automatically updated for everyone. Also, you can set alerts and reminders that will let you know when your teen is on the road and where they’re going. A report from the Virginia Tech Institute for Transportation found that you’re 23 times more likely to get in a car accident if you text while driving, far surpassing other distractions. According to edgarsnyder.com 11 teens die every day as a result of texting while driving. And 94% of teen drivers acknowledge the dangers of texting and driving, but 35% admitted to doing it anyway. HonkForHelp.com has a great list of 7 free apps that will ensure that your teen is not even tempted to text while they’re behind the wheel of a car! Our iTrail Solo is a small device that is easily hidden in a glove box, the iTrail can text or email you when the drivers goes over a certain speed. You can set the technology up with your own discretions called "excessive speed alert." Know about their lead foot before the police do and before anything tragic happens! Additionally, you can see starts and stops, idling, and whether or not they leave the Geo-fencing you've set up. You can create a safety zone -AKA, Geo-Fence - to alert you when your teen driver leaves this predetermined safety zone.The iTrail monitors their position on Google Maps and reports back to you every 30-60 seconds. Read more about monitoring your teen driver in our recent blog post. 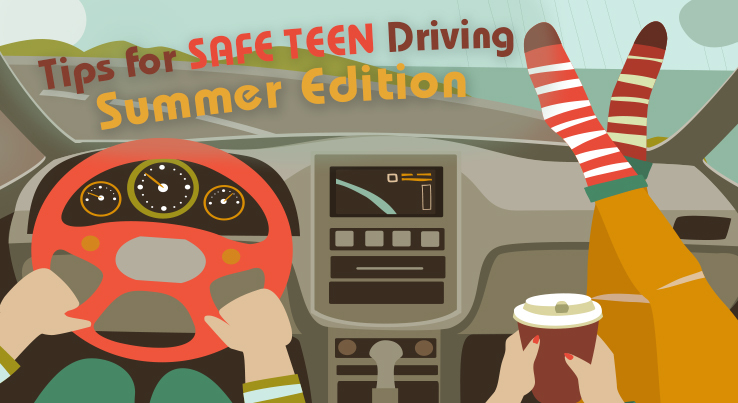 We hope helps you relax a little more and enjoy your summer with a teen driver! Contact us at 800-590-4272 or sales@kjbsecurity.com to purchase your iTrail Solo GPS Tracking device today!